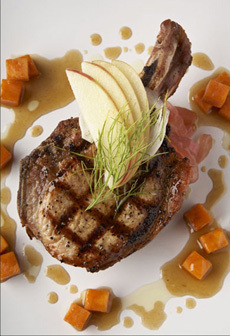 A sirloin pork chop from Chicago’s Bull & Bear restaurant. Photo courtesy Bull & Bear. For thousands of years, humans have been breeding pigs for food. The many uses of pork and pork products spread throughout Asia and eventually reached Europe where techniques for curing and preserving pork became increasingly popular due to the lack of refrigeration. With the exception of Antarctica, pork can be found on every continent. Just about every part of the pig has a practical culinary purpose. The meat and organs make nutritious foods. The fat is tasty and, some would say, the defining part of the pig. In the days before the emergence of vegetable oils like Crisco and Wesson, the lard was used as cooking oil, and still is a favorite fat for pie crusts and for frying. The bones have gelatinous qualities that make good stock for soups and sauces. You can go to your butcher, though, and buy the individual cuts. Learn all about them—and the sausages, pâtés and other products made with pork—in this glossary. This is Page 1 of a nine-page glossary. Click on the black links below to visit other pages. This glossary is protected by copyright and cannot be copied in whole or in part. A primal cut is a piece of meat initially separated from the carcass during butchering. Primal cuts differ culturally, so even the cuts in English-speaking countries—the U.S., U.K. and Australia, for example, will differ. * One example is fatback: In Europe it is an important primal cut of pork, but in North America fatback cuts are trimmings used in sausage-making or rendered into lard. 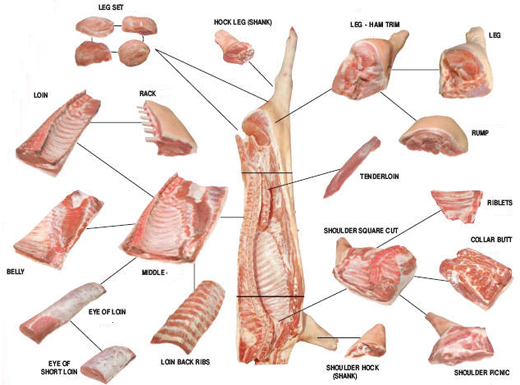 *Even within the U.S., what is a primal cut will differ between type of carcass—cattle, lamb and pigs. This glossary is Lifestyle Direct, Inc. All rights reserved. Photos are the copyright of their respective owners.